This fairy tale has a heroine with a mind of her own. 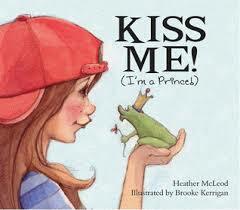 When the frog asks Ella to kiss him so he can get back to being a prince and make her a princess, she decides it would be more fun to have a talking frog than a life of royalty. After a while the frog gives up trying to be kissed and joins Ella in her games—they play hopscotch and Simon Says and go swimming in the pond. Eventually, however, a royal courtier retrieves the frog (prince) and takes him home. Ella is surprised to see the royal carriage reappear two weeks later carrying the prince (still a frog). This time he convinces her to kiss him, since the spell can be broken only by a true friend. Only when Ella is sure the prince wants to get back to normal, with promises that he will have more time to play, does she agree, “. . . and they played happily ever after.” This book works at so many levels, with delightful illustrations, a connection to traditional fairy tales, and a message about what is important in life, that I think it would make a wonderful addition for school libraries and teachers’ collections. This review is from Canadian Teacher Magazine’s Mar/Apr 2011 issue.